Michael Ballack (German pronunciation: [ˈmɪçaːʔeːl ˈbalak]; born 26 September 1976) is a retired German footballer. He is among the top goal scorers in the history of the German national team. Ballack wore the number 13 shirt for every team he has played for, save for 1. FC Kaiserslautern. He was selected by Pelé as one of FIFA's 100 Greatest Living Players, and as the UEFA Club Midfielder of the Year in 2002. He won the German Footballer of the Year award three times – in 2002, 2003 and 2005. Ballack was known for his passing range, powerful shot, physical strength and commanding presence in midfield. Ballack began his career as a youth at Chemnitzer FC, his local team, and made his professional debut in 1995. On 26 March 1996, Ballack made his debut for Germany's under-21 side. Although the team were relegated in his first season, his performances in the Regionalliga the following season led to a transfer to 1. FC Kaiserslautern in 1997. He won the Bundesliga in his first season at the club, his first major honour. He became a first team regular in 1998–99 season and also earned his first senior national cap for Germany. He moved to Bayer Leverkusen for €4.1 million in 1999. The 2001–02 season saw him win a slew of runners-up medals: Bayer Leverkusen finished second in the Bundesliga, DFB-Pokal, UEFA Champions League and Germany lost to Brazil in the 2002 World Cup Final. A €12.9 million move to Bayern Munich led to further honours: the team won the Bundesliga and DFB-Pokal double in 2003, 2005 and 2006. Ballack had become a prolific goalscorer from midfield, scoring 58 goals for Bayern between 2002 and 2006. He joined Premier League club Chelsea in mid-2006 and won English honours in his first season at the club. Injury ruled him out of much of 2007, but he returned the following season to help Chelsea reach their first ever Champions League final. He also went on to win the FA Cup again in 2009 and then once more as part of a league and cup double in 2010. Internationally, Ballack has played in the UEFA European Football Championship in 2000, 2004 and 2008, and the FIFA World Cup in 2002 and 2006. Jürgen Klinsmann appointed him captain of the national team in 2004. Ballack scored consecutive game-winning goals in the quarter-final and semi-final to help his country to the 2002 World Cup final, and led his team to the semi-finals of the 2006 World Cup and the Euro 2008 final. He was born in Görlitz, a town in Bezirk Dresden, East Germany (now Saxony, Germany), which straddles the Polish border. He is the only child of Stephan Ballack, an engineer, and his wife Karin, a secretary. The family moved to Chemnitz (then called Karl-Marx-Stadt) when Ballack was very young and it was there that he started to play football. Ballack's parents sent him to train with the side at age seven. He later moved on to FC Karl-Marx-Stadt (renamed Chemnitzer FC in 1990). His father had played second-division football himself in Germany. Unusual for his early age was Ballack's ability to use both feet with equal authority. In 1995, Ballack earned his first professional contract, thanks to his performances in the role of central midfielder. He was dubbed the "Little Kaiser", in reference to Franz Beckenbauer, who was nicknamed "Der Kaiser". His professional debut came on 4 August 1995, on the first day of the new 2. Bundesliga season. Chemnitz lost the game 2–1, against VfB Leipzig. At the end of the season, during which Ballack made 15 appearances, Chemnitz were relegated to the multi-tiered, regional third division. The following season, Ballack became a regular first-team player as Chemnitz missed out on an immediate return to the Bundesliga. He did not miss a game and scored ten goals for the "Sky Blues". It was not enough for Chemnitz to be promoted, but in the summer of 1997, coach Otto Rehhagel of just-promoted 1. FC Kaiserslautern signed Ballack at their return to top flight football. It was during the seventh match of the 1997–98 Bundesliga season, away to Karlsruhe, that Rehhagel decided to give Ballack his Bundesliga for the first time, substituting him onto the field for the final five minutes of the encounter. On 28 March 1998, Ballack made his first-team debut-start against Bayer Leverkusen. Ballack made 16 appearances for his new team during the season as the club became the first-ever newly promoted team to lift the Bundesliga title. In the following season, Ballack became both a regular member of the team (he made 30 appearances, scoring 4 goals in the league) and one of the side's leading players. Kaiserslautern reached the quarter finals of the Champions League, but were eliminated by Bayern Munich. It was at Bayer Leverkusen that Ballack made his breakthrough. Coaches Christoph Daum and Klaus Toppmöller granted him an attacking role in the midfield. Ballack was instrumental to the success of Leverkusen, scoring 27 goals in the league and nine in Europe over the course of his three seasons at the BayArena. In 2000, Bayer Leverkusen needed only a draw against minnows SpVgg Unterhaching to win the Bundesliga title, but an own goal by Ballack helped send the team to a crushing 0–2 defeat, while Bayern Munich clinched the title with a 3–1 victory over Werder Bremen. The 2001–02 season was a disappointing one for Bayer Leverkusen. In the Bundesliga, the team surrendered a five-point lead at the top of the table over the last three games of the season to finish second behind Borussia Dortmund; lost the UEFA Champions League final 2–1 to Real Madrid; and lost the DFB-Pokal final 4–2 to Schalke 04. These three runner-up finishes were dubbed a "Treble Horror": Bayer Leverkusen was dubbed "Bayer Neverkusen" in English, while the German nickname became Vizekusen. Ballack and Leverkusen teammates Bernd Schneider, Carsten Ramelow and Oliver Neuville were also beaten finalists with Germany in the 2002 FIFA World Cup, although Ballack was suspended for the final itself. Ballack finished with 17 league goals and his performance over the season led to him being voted into the UEFA.com users' Team of 2002 as well being named German Footballer of the Year. Ballack playing for Bayern Munich in April 2006. In spite of Real Madrid's interest, Ballack decided to sign with Bayern Munich in a €12.9 million deal in 2002 after his impressive performances in the World Cup. In his first season with the club, Bayern won the Bundesliga with 75 points as well as the DFB-Pokal, defeating former club 1. FC Kaiserslautern in the latter's final. In his second season, however, Bayern lost both their Bundesliga and DFB-Pokal crowns to Werder Bremen. In his third season with the Bavarians, Ballack enjoyed success in the 2004–05 season as Bayern Munich completed another double. New coach Felix Magath stated he was the only automatic starter in their midfield. In four seasons at Bayern, Ballack won three Bundesliga and DFB-Pokal doubles, scoring 44 goals in 107 Bundesliga matches. Between 1998 and 2005, Ballack scored 61 goals in total in the domestic league. 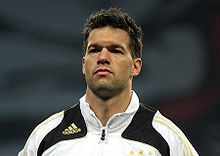 Ballack's critics, however, noted his frequent "choking" in important Champions League matches. This resulted in open public criticism from club general manager Uli Hoeneß, communications director Karl-Heinz Rummenigge and club president Franz Beckenbauer, all former Bayern players. Beckenbauer later went as far as to accuse Ballack of "saving his strength" for prospective employers after Ballack turned in an average performance in the 2006 DFB-Pokal final against Eintracht Frankfurt. Ballack agreed to join English Premier League club Chelsea on a free transfer on 15 May 2006. During his last season with Bayern, there were rumours of interest from Manchester United, Real Madrid, Internazionale and Milan, but Ballack instead chose to go to Stamford Bridge. Shortly after arriving at Chelsea, Ballack stated that he hoped to end his career at Chelsea. Ballack with Chelsea in 2008. Ballack's debut for Chelsea came on 31 July 2006, during a practice match at UCLA's intramural football pitch. Chelsea presented him to the media the following day where the club also gave him his favoured number 13 shirt, worn throughout his career. Upon doing so, William Gallas, who previously wore the number 13 shirt for Chelsea, was given the number 3 shirt. This move created animosity between Gallas and the club as Gallas felt that he was underappreciated. On 27 August 2006, Ballack made his Premier League debut for Chelsea against Blackburn Rovers. On 12 September, he scored his first goal for the club on his Champions League debut against Werder Bremen. He received the first straight red card of his career in Chelsea's 1–0 win over Liverpool on 17 September 2006, after being judged to have stamped on Mohamed Sissoko's leg. Ballack scored his first Premier League goal on 21 October 2006 against Portsmouth at Stamford Bridge with a header. His first FA Cup goal came in the 109th minute in the semi-final against Blackburn on 15 April 2007. This goal resulted in Chelsea progressing into the FA Cup final. He scored eight goals in all competitions for the club in the 2006–07 season, including a free-kick against Everton at Goodison Park, as well as a half-volley against Porto which sent Chelsea through to the quarter-finals of the Champions League. Throughout his first season at Chelsea, Ballack was criticised for his lethargic performances – for playing as though he had "a huge cigar in his mouth". On 29 April 2007, Chelsea released a statement on their official website, informing fans that Ballack had undergone ankle surgery in Munich. As a result, Ballack did not play in the FA Cup final against Manchester United, which Chelsea won 1–0 through Didier Drogba's extra time goal. This was Ballack's second trophy this season, his first being the League Cup, the final of which he started. Despite persistent rumours in the summer 2007 transfer window, Ballack denied that he wanted to leave and no such move materialised. Chelsea left Ballack out of their Champions League squad for the 2007–08 group stage as they realised that his injury would prevent him from playing any useful part and preferred to select the fully fit Steve Sidwell. The German international had an ankle operation in the summer and Chelsea could not take the risk of him not regaining full fitness before the end of the group stage. Thus, Ballack could not play in the Champions League before the knockout stages began in February. The club was only able to select 23 out of a possible 25 players for their Champions League squad due to the new UEFA regulations on "association-trained players" and "club-trained players". Due to this regulation, Chelsea were also unable to select young player Scott Sinclair and could only pick 23 players as their only "club-trained player" was John Terry. For this reason, it was deemed unwise to gamble on Ballack being fit at some point. Ballack made his return to the side in Chelsea's 2–0 League Cup win over Liverpool on 19 December 2007. Ballack tallied an assist late in the game to striker Andriy Shevchenko. On 26 December 2007, Ballack made his Premier League return in a thrilling game against Aston Villa which ended 4–4. He came on for Frank Lampard in the 26th minute after the latter had picked up a thigh injury. In first-half stoppage time, he won a penalty after being brought down in the box by Zat Knight, which Andriy Shevchenko converted. In the 88th minute, with the score tied at 3–3, Ballack stepped up to take a free-kick, which he buried into the bottom left corner of the goal, but the match ended in a 4–4 draw. Ballack in action against Fulham in December 2009. Ballack captained the Chelsea team in the absence of captain John Terry and vice-captain Frank Lampard in a 2–1 win over Newcastle United on 29 December 2007. Ballack then played his 50th game in a Chelsea shirt in a 2–1 win against Fulham in which he scored the winning goal for Chelsea. He also scored the only goal that won the match for Chelsea against Reading to extend the blues' winning streak to a record of nine. And, on 5 March 2007, he scored again, this time against Olympiacos in the Champions League round of 16 in a 3–0 win. He scored the winning goal in the 2–0 win in the second leg of the quarter-finals against Fenerbahçe, a victory that secured Chelsea a place in the semi-finals. Ballack continued to score vital goals and, on 26 April 2008, he scored a header and a penalty to give Chelsea a 2–1 win over Manchester United. He was named Man of The Match for his performance. It brought the two teams level in the race for the Premier League title only two matchdays before the end of the season. The season ended on a low note for Ballack as Chelsea finished runners-up in the League Cup, Premier League and Champions League. This completed another treble horror for Ballack and his club. On 29 June 2008, Germany, captained by Ballack, lost to Spain 1–0 in the final of UEFA Euro 2008. This became the second season in Ballack's career after 2002 that he was runner-up for four major trophies. The 2008–09 season started well for Ballack, as he set up Joe Cole to score the first goal in a 4–0 win over Portsmouth in the first game of the season. Ballack was injured shortly after missing the games against Manchester United, Liverpool and Arsenal. Ballack's return from injury has been a lift for Chelsea as he set up Deco to score a scissor kick in a 2–0 win against Bolton Wanderers. Ballack's first goal of the '09 season came against Southend United in their FA Cup replay, a match which Chelsea went on to win 4–1. Ballack's first Premier League goal of the 2008–09 season came on 11 April 2009 in a match against Bolton, ending 4–3 for Chelsea. He came on as a second-half substitute as Chelsea won the 2009 FA Cup final. On 2 June 2009, Ballack signed a one-year contract extension with Chelsea. Ballack on the ground with the ankle injury in the 2010 FA Cup Final that eventually ruled him out of the World Cup after a tackle from Boateng (23). In Chelsea's second game of the season, away at Sunderland, Ballack scored his first goal of the 2009–10 campaign in their 3–1 win. Ballack also scored against Burnley in a 3–0 win. Ballack made his first Champions League appearance for the season against Porto. On 20 September 2009, he scored his third league goal, against Tottenham. On 17 January 2010, he scored his fourth league goal and third assist in a 7–2 win against Sunderland. In Chelsea's fifth round FA Cup tie against Cardiff City, Ballack scored the goal which put the Blues back in front; Chelsea ultimately won 4–1. Ballack was sent off in Chelsea's 4–2 defeat against Manchester City on 27 February 2010. Chelsea went on to win the 2009–10 Premier League, Ballack's first league title in England. He also started as Chelsea were victorious against Portsmouth in the 2010 FA Cup final, however he would come off injured shortly before half-time after a tackle by Kevin-Prince Boateng. As a result of the injury, Ballack was not able to participate in the 2010 World Cup. On 9 June 2010, it was announced that Ballack, along with teammates Joe Cole and Juliano Belletti, would leave Chelsea on a free transfer after his contract was not renewed. It was reported that while manager Carlo Ancelotti wanted to retain Ballack, club owner Roman Abramovich was only willing to offer a one-year deal due to Ballack's age. On 25 June 2010, Ballack signed a two-year contract with former club Bayer Leverkusen. On 19 August 2010, he scored the first goal for Leverkusen in a 3–0 win against Tavriya Simferopol in the UEFA Europa League qualifiers. On 6 October 2010, it was announced that Ballack would not play again in 2010 at the club or international level due to a shin injury sustained 11 September 2010 in a Bundesliga match against Hannover 96. On 20 February 2011, Ballack made his return from injury, coming on as a substitute for Simon Rolfes against VfB Stuttgart; Leverkusen won the match 4–2. Ballack scored his second Europa League goal against Metalist Kharkiv, a match Leverkusen won 2–0 and the two-legged tie 6–0 on aggregate to progress to the round of 16. Ballack played the full 90 minutes against Schalke 04, assisting Eren Derdiyok's goal in an eventual 2–0 victory. Ballack announced his retirement on 2 October 2012. He had been in talks with Major League Soccer and A-League club Western Sydney Wanderers. On 5 June 2013, Ballack played a farewell match at Leipzig's Red Bull Arena. The match was won by a World XI 4–3 against the "Friends of Ballack", with Ballack scoring his second hat-trick in his career. First he scored two goals with "Friends of Ballack" in the first half and scored his third goal and the winner in the second half for the World XI. Participants in the match included former teammates and friends Lothar Matthäus, Didier Drogba, Miroslav Klose, Andriy Shevchenko, Phillip Lahm, Hasan Salihamidžić, Dimitar Berbatov, Michael Essien, André Schürrle, Ricardo Carvalho, Dietmar Hamann, Florent Malouda, Carsten Jancker, Torsten Frings, Jens Lehmann, Christian Wörns, Mehdi Mahdavikia and Per Mertesacker, as well as Formula 1 racing driver Michael Schumacher. The teams were coached by Ballack's former Chelsea coach José Mourinho and his former national team coach Rudi Völler. On 26 March 1996, Ballack debuted for the Germany national under-21 team against Denmark, shortly after signing for Chemnitzer FC. In all, he played 19 matches for this side, scoring four goals. Then, following his move to 1. FC Kaiserslautern, senior team head coach Berti Vogts called him up to the squad. Ballack's first senior Germany appearance, however, did not come until 28 April 1999, when he came on as a substitute for Dietmar Hamann in a match against Scotland. Ballack only played 63 minutes at UEFA Euro 2000. In the 2002 FIFA World Cup, he scored in matches against the United States and South Korea during the knockout rounds as Germany reached the final. However, he was booked for a tactical foul during the semi-final match against South Korea and was suspended for the final, which Germany went on to lose 2–0 to Brazil. He was included in the World Cup All Star Team. Ballack missing the final ultimately led to a lasting revision of the yellow card amnesty rule in order "to give the best players a chance to play in the final". Following Euro 2004, Jürgen Klinsmann replaced Rudi Völler at the helm of the national team and Ballack took over from Oliver Kahn as captain. In the 2006 World Cup, he was unable to start in Germany's first game against Costa Rica due to a calf strain, but appeared in the following five matches. Germany were eliminated in the semi-finals, but they managed to clinch third place in a match against Portugal. He was named Man of the Match in the games against Ecuador and Argentina, and was included in FIFA's World Cup All Star Team for a second consecutive time. After the tournmanent, Klinsmann stood down as national team head coach and was succeeded by assistant Joachim Löw. Ballack started and captained Germany in their first game of Euro 2008 against Poland. He proved to be an influential figure in the midfield as Germany came back from a shock defeat to Croatia to make it to the final, scoring a free kick against Austria to secure Germany a 1–0 win and a place in the quarter-finals. In the quarter-finals, he scored a controversial header against Portugal to make the score 3–1 in their 3–2 win after an assist by Bastian Schweinsteiger's 60th minute free-kick, helping Germany to advance to the semi-finals. Germany went on to beat Turkey 3–2 in the semifinals. Prior to the final, Ballack sustained a calf injury but eventually overcame it in time. Germany, however, ended up losing 1–0 to Spain. Nevertheless, he was named in the Team of the Tournament. Between June 2005 and Ballack's retirement, Germany never lost a game when Ballack scored. He scored four goals in the 2010 World Cup qualifiers. Ballack, however, missed the 2010 World Cup following a foul by Portsmouth's Kevin-Prince Boateng in the 2010 FA Cup final that caused an ankle injury. Boateng is a former Germany under-21 player and half-brother of current German international Jérôme Boateng. Kevin-Prince Boateng went on to play for Ghana against the German team in the World Cup group stages. Ballack did travel to South Africa to provide moral support for the national team but he departed after Philipp Lahm, who was appointed team captain due to Ballack's injury, commented after the quarter-finals that he would not relinquish the captaincy back to Ballack. Team manager Oliver Bierhoff criticized Lahm's comments and clarified the situation, saying, "Philipp Lahm is the World Cup captain and Michael Ballack is still the captain." Germany played strongly in the tournament despite Ballack's absence, including a 4–1 win over England and a 4–0 win over Argentina en route to finishing third, thanks to emerging midfield talents such as Sami Khedira, Thomas Müller, Mesut Özil and Bastian Schweinsteiger. Former German captain Lothar Matthäus suggested that Ballack's absence had allowed these young players to blossom. Since the 2010 World Cup qualifiers, Ballack had not been called up for any international matches. It was reported that Germany coach Joachim Löw was waiting for Ballack to retire from international football after the 2010 World Cup, however Ballack refused to give up despite a rash of injuries suffered in 2010–11 with Bayer Leverkusen. On 16 June 2011, it was announced that Ballack would no longer be a part of the national team. The German Football Association (DFB) offered him two friendlies to reach 100 matches for Germany, which he refused, accusing Löw of disrespecting him ever since his injury dating back to March 2010 and calling the invitation to compete in another two games for Germany a "farce". Ballack is considered to be one of the most complete and versatile midfielders of his generation; he played in several midfield positions during his career, and was noted for his powerful shot with both feet. On a technical level, he was a commanding, physically strong and aggressive player, with excellent passing range, who moved the ball efficiently. The technicality and intelligence of his game was extremely high. He started his football career as a sweeper, but when he moved to Leverkusen in 1999, then-coach Christoph Daum moved him to midfield. He adapted to a deeper role during his spell at Chelsea. In 2011, Ballack's international coach at the time, Joachim Löw, praised him, describing him as a player who "exudes authority and calm on the pitch". Ballack's surname is of Sorbian origin. He was the only child of father Stephan, an engineer who played third-division football, and mother Karin, a secretary and swimmer. On 14 July 2008, Ballack married his long-time girlfriend Simone Lambe. The couple have three children together: Louis (born 2001), Emilio (born 2002), and Jordi (born 2005). The couple divorced in 2012. Currently, he has been dating Lebanese Natacha Tannous since 2015. During Euro 2012, the 2014 World Cup, and Euro 2016, Ballack worked as a studio analyst for ESPN, often alongside Alexi Lalas. 1.^ There was no other competition in Germany other than the league, German Cup, German League Cup, and European competitions. 2.^ Includes FA Community Shield. 28 29 June 2005 Red Bull Arena, Leipzig Mexico 4–3 4–3 a.e.t. ^ "FIFA World Cup Germany 2006 – List of Players" (PDF). Fédération Internationale de Football Association (FIFA). p. 12. Retrieved 26 July 2013. ^ "Player Profile: Michael Ballack". chelseafc.com. Archived from the original on 26 November 2010. ^ a b c Grohmann, Karolos (2 October 2012). "Former Germany captain Ballack retires at 36". in.mobile.reuters.com. Reuters. Retrieved 17 August 2014. ^ "Player Profile". ESPN Soccernet. Archived from the original on 18 July 2012. Retrieved 9 April 2012. ^ a b c d e "Michael Ballack". Fussballdaten.de. Archived from the original on 16 February 2010. Retrieved 9 May 2013. ^ a b c d e "Michael Ballack: a nearly man or an undisputed midfield genius?". The Guardian. 5 June 2013. Archived from the original on 16 February 2010. Retrieved 6 June 2013. ^ "Chemnitzer FC – VfB Leipzig". Fussballdaten.de (in German). Archived from the original on 16 February 2010. Retrieved 4 July 2011. ^ "Karlsruher SC – 1. FC Kaiserslautern". Fussballdaten.de (in German). Archived from the original on 16 February 2010. Retrieved 4 July 2011. ^ "1. FC Kaiserslautern – Bayer Leverkusen". Fussballdaten.de (in German). Archived from the original on 16 February 2010. Retrieved 4 July 2011. ^ Marcel Haisma (15 January 2010). "Michael Ballack – Matches in European Cups". RSSSF. Archived from the original on 16 February 2010. Retrieved 4 January 2013. ^ "SpVgg Unterhaching – Bayer Leverkusen". Fussballdaten.de (in German). Archived from the original on 16 February 2010. Retrieved 4 July 2011. ^ "Der 34. Spieltag der Bundesliga 1999/2000". Fussballdaten.de (in German). Archived from the original on 16 February 2010. Retrieved 4 July 2011. ^ "Balanced Ballack is the finished article". The Daily Telegraph. UK. 7 March 2006. Archived from the original on 25 December 2007. Retrieved 14 March 2008. ^ a b c d Arnhold, Matthias (20 December 2012). "Michael Ballack – Matches and League Goals". RSSSF. Archived from the original on 16 February 2010. Retrieved 9 May 2013. ^ "Rummenigge: Ballack Deal Done". Sporting Life. 29 April 2006. Archived from the original on 30 September 2007. Retrieved 12 May 2013. ^ "Chelsea announce Ballack capture". BBC Sport. 15 May 2006. Archived from the original on 16 February 2010. Retrieved 15 May 2006. ^ "Ballack to keep suitors waiting". BBC Sport. 16 November 2005. Archived from the original on 16 February 2010. Retrieved 15 May 2006. ^ "Ballack intends to stay at Chelsea for rest of career". The Daily Telegraph. 12 March 2009. Retrieved 4 July 2011. ^ Hatherall, Chris (3 August 2006). "Mourinho gives Ballack Gallas' lucky No 13 shirt". The Independent on Sunday. Archived from the original on 16 February 2010. Retrieved 28 November 2008. ^ "Ballack sent off against Liverpool". BBC Sport. 17 September 2006. Archived from the original on 16 February 2010. Retrieved 4 July 2011. ^ Hansen, Alan (27 November 2006). "Time for Ballack and Shevchenko to deliver". The Daily Telegraph. Archived from the original on 16 February 2010. Retrieved 24 December 2009. ^ "Statement on Michael Ballack". Chelsea F.C. 28 April 2007. Archived from the original on 21 July 2010. Retrieved 4 July 2011. ^ "Ballack's Chelsea future in doubt as Mourinho axes him from Europe squad". Mail Online. The Daily Mail. 4 September 2007. Archived from the original on 23 July 2012. Retrieved 24 December 2009. ^ "Ballack told: Leave Chelsea to save your career". Mail Online. The Daily Mail. 11 September 2007. Retrieved 24 December 2009. ^ "Ballack hoping to end his career at Chelsea". Mail Online. Daily Mail. 10 October 2007. Archived from the original on 7 July 2013. Retrieved 12 May 2013. ^ "Blues omit Ballack from Euro list". BBC Sport. 4 September 2007. Archived from the original on 21 July 2010. Retrieved 14 March 2008. ^ "Kenyon Makes Ballack Statement". Chelsea FC. 5 September 2007. Archived from the original on 14 October 2007. Retrieved 13 May 2013. ^ "Ballack deal agreed". Chelsea F.C. 2 June 2009. Archived from the original on 16 September 2011. Retrieved 13 May 2013. ^ "Tevez sinks Blues". ESPN Soccernet. 27 February 2009. Archived from the original on 21 July 2010. Retrieved 25 June 2010. ^ "Chelsea break records to win title". ESPN FC. 9 May 2009. Archived from the original on 21 July 2010. Retrieved 25 June 2010. ^ a b James, Grant (9 October 2012). "Michael Ballack: Farewell to a Chelsea Legend". Football Analysis. Retrieved 1 August 2014. ^ "Joe Cole, Juliano Belletti and Michael Ballack to leave Chelsea". BBC Sport. 9 June 2010. Archived from the original on 21 July 2010. Retrieved 4 July 2011. ^ "Bayer Leverkusen sign Michael Ballack on two-year contract". The Guardian. 25 June 2010. Archived from the original on 21 July 2010. Retrieved 4 July 2011. ^ "Leverkusen prove too strong for Metalist". UEFA. 24 February 2011. Archived from the original on 21 July 2010. Retrieved 25 February 2011. ^ "Leverkusen narrow gap on Dortmund". Deutsche Welle. 20 March 2011. Archived from the original on 21 July 2010. Retrieved 21 March 2011. ^ a b "Ex-Capitano Michael Ballack beendet seine Karriere". Die Welt (in German). 2 October 2012. Archived from the original on 21 July 2010. Retrieved 2 October 2012. ^ "Ballack announces retirement". ESPN FC. 2 October 2012. Archived from the original on 21 July 2010. Retrieved 2 October 2012. ^ "Football stars celebrate Ballack's career in charity match". Deutsche Welle. 5 June 2013. Archived from the original on 21 July 2010. ^ "Ballack's debut against Scotland". Fussballdaten.de (in German). Archived from the original on 21 July 2010. Retrieved 4 July 2011. ^ Cawthorne, Andrew (19 June 2010). "Yellow card rule changed to keep big names in final". Reuters. Retrieved 1 May 2018. ^ "13 BALLACK Michael". FIFA. Archived from the original on 11 August 2006. Retrieved 13 May 2013. ^ "Germany–Poland Euro 08". Fussballdaten.de (in German). Archived from the original on 21 July 2010. Retrieved 4 July 2011. ^ Mamrud, Roberto (17 September 2010). "Michael Ballack – Goals in International Matches". RSSSF. Archived from the original on 21 July 2010. Retrieved 9 May 2013. ^ "DFB: Ballack fällt für die WM aus" (in German). ZDF. 17 May 2010. Archived from the original on 21 July 2010. Retrieved 17 May 2010. ^ "A Power Struggle on the German National Team?". Spiegel Online. 6 July 2010. Archived from the original on 16 February 2010. Retrieved 17 February 2012. ^ "The Team Is 'Winning Hearts Beyond Germany's Borders'". Spiegel Online. 5 July 2010. Archived from the original on 16 February 2010. Retrieved 17 February 2012. ^ Ogden, Mark (3 July 2010). "Argentina v Germany: Lothar Matthäus says Germany are better without Michael Ballack". The Telegraph. Retrieved 26 August 2014. ^ Honigstein, Raphael (31 January 2012). "Pride, pig-headedness and glee: Leverkusen's Project Ballack fails". The Guardian. Archived from the original on 16 February 2010. Retrieved 17 February 2012. ^ "Ballack: "An Scheinheiligkeit nicht zu überbieten". kicker (in German). 17 June 2011. Archived from the original on 16 February 2010. Retrieved 22 June 2011. ^ "Löw: "Weiß, was besprochen wurde"". kicker (in German). 18 June 2011. Archived from the original on 16 February 2010. Retrieved 22 June 2011. ^ "Ballack on the ball". www.sportstaronnet.com. Retrieved 7 September 2015. ^ Reedie, Euan (2008). Michael Ballack – The Biography. London, England: John Blake. pp. 41–65. ^ "Loew impressed with Ballack". Times LIVE. 18 April 2011. Retrieved 7 September 2015. ^ Die Welt (2006). "Ballack, das Plappermaul". Die Welt. Ballack deutet nämlich Jürgen Udolph, der Leipziger Professor für Namenkunde, als eine sorbische Sproßform von Balthasar. Gegen diese Lesart kommt aber entschiedener Widerstand aus dem Institut für Slawistik an der Hamburger Universität. Ballack, heißt es da, kommt vom slawischen "bala" für erzählen, sprechen – in abwertender Form also: quasseln, plappern -, und "-ak" ist ein Suffix (Nachsilbe) und bedeutet, daß einer das tut. Ein "agens", wie die Namenforscher sagen. Ballack (richtig geschrieben: Balak) wäre also auf gut deutsch: das Plappermaul. Der Ball heißt auf polnisch: pilka. ^ Hannah Cleaver (15 April 2006). "The secret life of Germany's poster boy". Telegraph. ^ Cadwalladr, Carole (4 June 2006). "Meet the real footballers' wives". The Guardian. UK. Archived from the original on 18 April 2010. Retrieved 10 May 2009. ^ "Personal Data". Michael Ballack. 16 January 2009. Retrieved 16 January 2009. ^ "Ex-Goldman Sachs ED and girlfriend of Michael Ballack joins a crowdfunding company". efinancialcareers. 17 May 2017. ^ "Ballack's negotiations with Montreal Impact have stalled as club target Clarence Seedorf". Goal.com. 5 June 2012. Archived from the original on 16 February 2010. Retrieved 1 July 2012. ^ "Ballack, Michael". kicker.de (in German). kicker. Retrieved 11 August 2014. ^ "Chemnitzer FC » Appearances DFB-Pokal 1995/1996". WorldFootball.Net. Retrieved 11 August 2014. ^ "Chemnitzer FC » Appearances DFB-Pokal 1996/1997". WorldFootball.net. Retrieved 11 August 2014. ^ "Michael Ballack" (in German). Fussballdaten.de. Retrieved 11 August 2014. ^ "Michael Ballack". ESPN FC. ESPN. Retrieved 11 August 2014. ^ "Mixhael Ballack". ESPN FC. ESPN. Retrieved 11 August 2014. ^ a b c d e "M. Ballack". Soccerway. Retrieved 5 September 2014. ^ "Michael Ballack: Overview". Premier League. Retrieved 15 April 2018. ^ Pierrend, José Luis (4 September 2014). "(West) Germany – Footballer of the Year". RSSSF. Retrieved 5 September 2014. ^ "Bundesliga Historie 2001/02" (in German). kicker. ^ "Bundesliga Historie 2002/03" (in German). kicker. ^ "Bundesliga Historie 2004/05" (in German). kicker. ^ "Bundesliga Historie 2005/06" (in German). kicker. ^ "Alle Männer des Jahres". kicker (in German). 26 December 2011. Archived from the original on 16 February 2010. Retrieved 19 October 2012. ^ Leme de Arruda, Marcelo (20 October 2015). "FIFA XI´s Matches – Full Info". RSSSF. Retrieved 26 October 2015. ^ "Elf des Jahrhunderts". Kölnische Rundschau (in German). 21 May 2004. Archived from the original on 16 February 2010. Retrieved 13 May 2013. ^ "Juni 2008 - Ballack" (in German). Sportschau. Retrieved 11 December 2018. Wikimedia Commons has media related to Michael Ballack.